This blog is a recompilation of events and material relevant to the Catalan classic “Els sots feréstecs”, written by Raimon Casellas and first publised in 1901. The book was translated into English for the first time by Alan Yates and edited by Eva Bosch. Dedalus Books published it in February 2014. 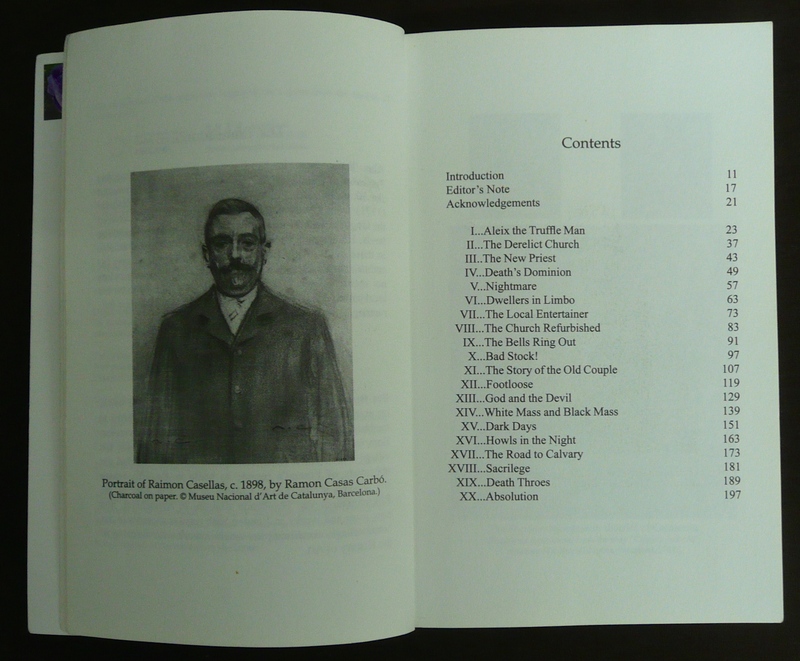 Els sots férestecs (Dark Vales) was written by Raimon Casellas (1855-1910) and first published in Barcelona in 1901. Often referred to as the first truly modern novel in Catalan, it is a powerful and highly stylised fin-de-siècle creation, suffused with intellectual angst and folk-Catholic gloom. The action is set in the rugged gorges of the Montmany district, north of Barcelona., where the light of civilisation and progress has not penetrated. An idealistic priest, Mossèn Llàtzer, banished for heterodoxy to these backwoods, strives to redeem himself by bringing ‘salvation’ to his brutal, benighted parishioners. The antagonism he meets is first expressed in his frustrated efforts to involve them in restoration of the ruinous church buildings, and it comes to a head in his conflict with the local prostitute, Roda-soques (Footloose: the incarnation of the forces of Evil and parody of the Decadent femme fatale) who, from her own hill-top sanctuary in the tavern, services the degenerate, poverty-stricken peasants and woodlanders of the ravines. The self-appointed messiah is eventually driven to a severe nervous breakdown and catatonic depression, leading to a conclusion which leaves open so many big questions posed by the dense and carefully wrought narrative. The book can be read as a symbolic representation of the stresses and contradictions in the endeavours of the artist/intellectual to enlighten and transform society. Such concerns link with ‘regenerationist’ tendencies expressed in the Catalan movement of Modernisme. This was a dynamic cultural phase which fed on a wide range of (often contradictory) influences from the contemporary European panorama: late Naturalism, Symbolism, Decadent art; Nietzsche, Schopenhauer, Wagner; Lombroso, Lebon, etc. The main character Mossèn Llàtzer (Father Lazarus: the name suggesting a faint ambiguity in the novel’s bleak denouement) confronts the Devil and his own devils, preaching Goodness and Ideals, while Evil and Animal Instinct are embodied in the figure of the whore. The peasants are portrayed collectively as a herd (la bête humaine), an amorphous mass barely differentiated from their primitive surroundings. This effect is accentuated by the way in which Aleix the Truffle Man is obliquely individuated, made representative, as the first character to appear in the story. The portrayal of Father Llàtzer’s aged household companions provides a sort of parodic replication of the priest’s drama. Such features evince the author’s control of his material and his sensitive talent for narrative composition. His artistry in locating much of the narrative perspective inside the priest’s consciousness is most effective. Also notable among the distinctive features of the novel is the powerful use of language, fashioned by a deliberate concern to achieve poetic effects, through rhetorical devices and through potent images of rural life. (In this respect, as also in his rich vocabulary, Casellas can be compared with Thomas Hardy, whose prose has been a discreet model in the preparation of the English translation.) The style forcefully conveys the tense stand-off between the depersonalisation, ignorance and brutality of the woodlanders and the idealistic, faith-based aspirations of the devout rector. Despite its strongly symbolic character, the book has a solid realistic base: the clearings and buildings described are readily identifiable on the map, and it reflects the historical reality of trials and tribulations suffered by the rectors of Sant Pau de Montmany. It also reflects the extreme poverty of rural Catalonia at the turn of the 20thcentury. The author knew the area well through his regular sojourns at a local farmstead., and some of the characters are drawn by him from real life. The symbolist features of the text thus have a firm grounding. Moreover, the novelist’s suicide in 1910 might have been related to tensions and anxieties communicated in Els sots feréstecs. The experience in translating Casellas’s text has confirmed our conviction that this is a work which, although very much a product of its own epoch, retains appeal for a present-day readership and deserves international projection. The issues and concerns addressed by the author, while topically specific to the crisis of the fin de siècle, can be transferred into a 21st-century context and ‘re-read’ through a prism shaped by recent trends in both the literary and the cinematic idioms. It is not difficult to conceive a film adaptation of Ravines along the lines of F. Ford Coppola’s ‘translation’ (Apocalypse Now) of Conrad’s The Heart of Darkness, for example.